The Nationals enter the final series before the All-Star break at 46-46 — not exactly what they had envisioned before the season began. They at least have that in common with the Mets. But the similarities do not go much further. Washington is still within striking distance of a playoff spot, and they have already begun moves to bolster their postseason chances. The biggest addition thus far is mentioned below in this addition of the stats preview. 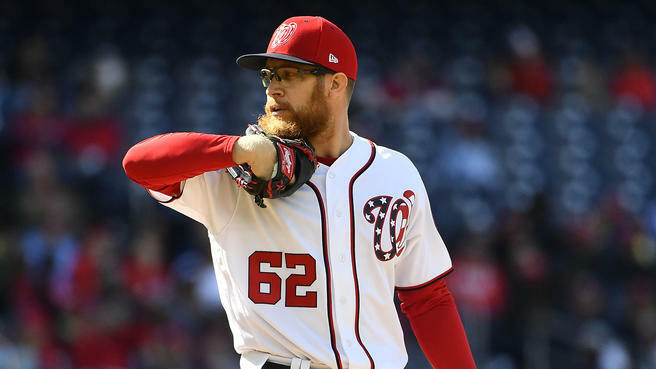 Herrera’s Transition: The Nationals struck early in this year’s trade season to acquire one of the better relievers on the market. Kelvin Herrera was supposed to be a lock down late-inning asset to further bolster Washington’s pen, but the start to his stint with the Nationals has not been completely smooth sailing. He has only had nine appearances with his new team, and they have not been awful, just not quite what he was doing with Kansas City before he came over. So far he has walked 4.2 batters per nine in D.C., after an incredible 0.7 per nine with the Royals. That means he has already walked twice as many (four) batters in a third of the innings in his new city. His ERA has seen a similar jump (1.05 to 4.15). Run estimators like FIP and DRA have drastically different views of Herrera’s performance, as he had a 2.67 FIP in KC that has jumped to 5.77 in Washington, while his DRA has remained steady (3.47 to 3.41). So which version is the real Herrera: the elite control artist that he was in Kansas City or the less impressive reliever he has been in DC? The answer is probably somewhere in the middle, because both 2018 samples are small enough not to completely buy into them. He has a long track record of being a very good reliever with good, but not elite, walk rates, so chances are that is close to what he will be going forward for the Nationals. Coming to Harper’s Defense: A lot of ink has been spilt about the struggles of Bryce Harper at the plate this season, and it speaks to his talent level that a .302 TAv is a down year. What has not been talked about as much, is how defensive metrics have also almost universally dinged Harper for his play. He has -12.7 Fielding Runs Above Average, which if the season ended today would be nearly ten runs worse than last year (which was his previous season low at -3.4). Up until last season, Harper had generally been rated as an asset in the field, and even though defensive metrics are not as reliable as offensive ones (especially in half season samples), his defensive numbers are certainly not an encouraging sign. By FRAA, he has been the second worst fielder in baseball. With his free agency looming this offseason, it will be fascinating to see how potential suitors view his statistical regression in nearly every category. Hellickson’s Resurgence: After a statistically miserable season split between Philadelphia and Baltimore last year, Jeremy Hellickson has been a stabilizing presence the last few months in the Nationals’ rotation. His solid 3.47 ERA, 3.89 FIP and 3.71 DRA have been a huge improvement over his 5.43 ERA, 5.77 FIP and 6.31 DRA last year. Two things that stick out are his career low walk numbers (1.58 BB/9) and his increased reliance on his curveball. The curve (26.1%) and changeup (24.4%) are his most frequent pitches, which makes sense as they generate the highest whiff rates in his repertoire. Specifically with the curve, his usage has more than doubled (12.4% in 2017), and so have the whiff rates on the pitch (5.5% in 2017 to 13.1% in 2018). As Hellickson takes the mound in the series finale before the All-Star break, specifically watch Michael Conforto’s at bats, as he has hit just .045 (1-for-22) on curveballs this year. The Good: Max Scherzer is one of three starting pitchers with an FIP under 2 (Sale and Verlander are the other two; Syndergaard is fourth best at 2.06). The Bad: Sean Doolittle has a GB% of just 27%. The Ugly: Ryan Madson has a left-on-base rate of 65%. As Syndergaard is set to make his return Friday, let’s hope he picks up where he left off. On a rate basis, the 2018 iteration of Noah may be the best we have seen him. His WARP/200 inning pace is 7.42, the highest in his career. His DRA of 2.06 would also be a career best.